Create a lasting suet feeding station in your yard using the Songbird Essentials Green and Brown Suet Feeder with Tail Prop. Placing a suet feeder in your garden can attract birds that traditionally do not use seed feeders, such as orioles and mockingbirds, for a fun and busy bird garden. The sturdy, soft brown frame of this piece is crafted from recycled plastic, for an environmentally friendly and lasting unit. Its center accommodates one standard suet cake, and the 0.5" square mesh here allows birds to easily reach the treat. The unique frame allows birds to cling and dine, and the dark green prop at the base helps woodpeckers keep their balance while eating. A green plastic lid covers the suet, and lifts up the attached steel cable for refilling or cleaning. The durable, recycled plastic frame will not fade, peel, crack, rot, or warp, for a feeder you can enjoy for many seasons, and its natural color scheme enhances your lawn. Hang this item in a tree or on a hook for a fantastic and busy bird garden. 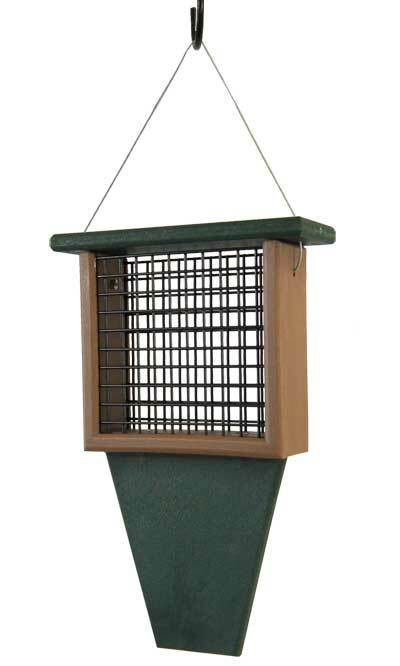 Offer suet to many birds using this Green and Brown Suet Feeder with Tail Prop. Lifetime guarantee. Galvanized Metal Hanging Squirrel Baffle, 21.25" dia.